Canonbury railway station serves the districts of Canonbury and Highbury within the London Borough of Islington in north London. It is on London Overground's North London Line and East London Line. The station and all trains serving it are operated by London Overground, and the station is in Travelcard Zone 2. This location of the station is close to the boundary with the London Borough of Hackney. The station originally opened in 1858 to the east of its present location as "Newington Road & Balls Pond" and was renamed "Canonbury" shortly before the move to its present site in 1870. In 2007, the ticket office was extensively refurbished, as part of the station upgrade programme delivered through conversion to London Overground. On 1 June 2010, as a result of the East London Line extension, North London Line services were rerouted to the newly constructed platforms 3 and 4, with the East London Line trains now using refurbished platforms 1 and 2. To the west of the station is the Canonbury curve, a freight-only connection through the Canonbury tunnel to the East Coast Main Line at Finsbury Park which had opened in 1874. A passenger service operated to/from Broad Street from 1875 until 1976 when suburban services from the main line were diverted to Moorgate via the newly built surface connection between Finsbury Park and Drayton Park. 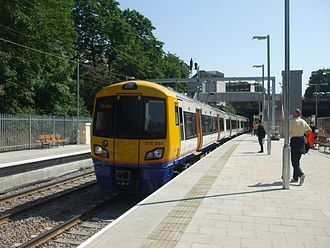 The North London Line between Gospel Oak and Stratford closed in February 2010, for installing a new signalling system and for extending 30 platforms, in order in due course to allow four-car trains to run on the London Overground network. After reopening on 1 June 2010, the work continued until May 2011 with a reduced service operating Mondays to Saturdays and no service at all on Sundays. During the NLL closure of February–May 2010, the through route was moved to the north side of the cutting, and two adjacent brand new platforms provided, an island platform replacing the former eastbound platform. This allowed the extended ELL to serve Canonbury (and Highbury & Islington) on a pair of completely segregated tracks occupying the former route on the south side of the cutting. Since the northern extension of the East London Line, which was completed and opened in March 2011, Canonbury station has had four platforms, giving interchange between the London Overground East London Line (ELL) and North London Line (NLL) with step-free access to all platforms and peak service frequencies of 12 trains per hour in each direction. All times below are correct as of the May 2011 timetables. 4 westbound to Richmond via Camden Road and Willesden Junction. 6 eastbound to Stratford via Hackney. 8 northbound to Highbury & Islington. 4 southbound to Crystal Palace via Surrey Quays and Sydenham. 4 southbound to West Croydon via Surrey Quays & Norwood Junction (not Sundays). Services run through the night on Friday and Saturday. London Buses routes 30 and 236 serve the station. ^ "National Rail Enquiries: Cannonbury (CNN)". National Rail. Retrieved 8 September 2014. ^ "Disused Stations: Hackney Station (1st)". Retrieved 8 September 2014. ^ Joe Brown (2006). London Railway Atlas. Ian Allan Publishing. ^ Vic Mitchell & Keith Smith (1997). North London Line. Middleton Press. ^ "London Overground to close from Gospel Oak to Stratford as part of £326m upgrade to deliver longer, more frequent trains". TfL. 15 February 2010. Retrieved 29 May 2011. 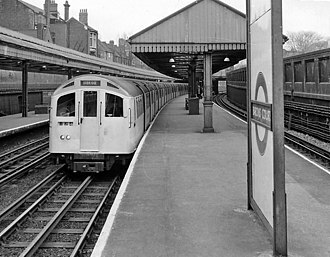 Wikimedia Commons has media related to Canonbury railway station. Honor Oak Park railway station serves the suburban area of Honor Oak in the London Borough of Lewisham. It is located between Brockley and Forest Hill, the station is operated by London Overground, with London Overground and Southern trains serving the station. Thameslink and some Southern services pass through the station and it is located in Travelcard Zone 3. The line on which it stands was opened in 1839, but this station was opened by the London, Brighton. There are four tracks through the station, with platforms on the outer Slow lines and these platforms are connected to the booking office by a footbridge. The station has benefited from the London Overground East London Line extension, completed in May 2010, commuter areas such as Canary Wharf, Liverpool Street, Kings Cross and Waterloo are just one change of train away. From 2018/19 you will be able to interchange with Crossrail service at Whitechapel. 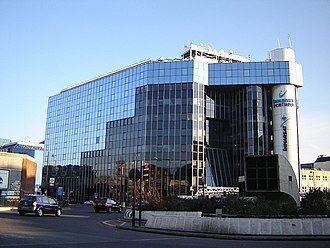 This would enable most of London to be accessible in a short time compared to now. This will coincide with Crossrail being constructed at Whitechapel ensuring that East-to-West as well as South-to-North London will be accessible from Honor Oak Park. The Thames Tunnel is an underwater tunnel, built beneath the River Thames in London, connecting Rotherhithe and Wapping. It measures 35 feet wide by 20 feet high and is 1,300 feet long, running at a depth of 75 feet below the river surface measured at high tide, the tunnel was originally designed for horse-drawn carriages, but was never used for that purpose. It now forms part of the London Overground railway network under ownership of Transport for London. At the start of the 19th century, there was a pressing need for a new connection between the north and south banks of the Thames to link the expanding docks on each side of the river. 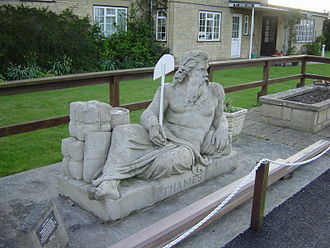 The engineer Ralph Dodd tried, but failed, to build a tunnel between Gravesend and Tilbury in 1799, the Cornish miners were used to hard rock and did not modify their methods for soft clay and quicksand. This Thames Archway project was abandoned after the pilot tunnel flooded twice when 1,000 feet of a total of 1,200 feet had been dug. It only measured 2–3 feet by 5 feet, and was intended as the drain for a tunnel for passenger use. 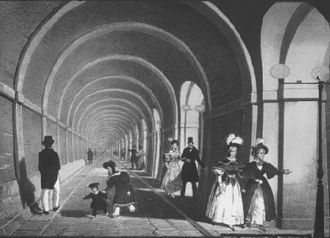 The failure of the Thames Archway project led engineers to conclude that a tunnel is impracticable. However, the Anglo-French engineer Marc Brunel refused to accept this conclusion, in 1814 he proposed to Emperor Alexander I of Russia a plan to build a tunnel under the river Neva in St Petersburg. 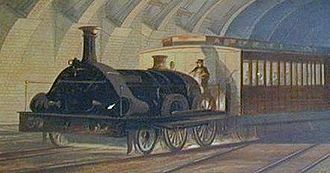 This scheme was turned down but Brunel continued to develop ideas for new methods of tunnelling, Brunel patented the tunnelling shield, a revolutionary advance in tunnelling technology, in January 1818. In 1823 Brunel produced a plan for a tunnel between Rotherhithe and Wapping, which would be dug using his new shield. Financing was soon found from private investors, including the Duke of Wellington, and a Thames Tunnel Company was formed in 1824, the first step was the construction of a large shaft on the south bank at Rotherhithe,150 feet back from the river bank. It was dug by assembling an iron ring 50 feet in diameter above ground, a brick wall 40 feet high and 3 feet thick was built on top of this, with a powerful steam engine surmounting it to drive the excavations pumps. 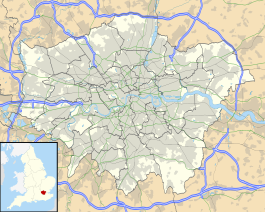 Canonbury is a residential district in the London Borough of Islington in the north of London. It is roughly in the area between Essex Road, Upper Street and Cross Street and either side of St Pauls Road, in 1253 land in the area was granted to the Canons of St Bartholomew’s Priory and became known as Canonbury. The area continued predominantly as open land until it was developed as a suburb in the nineteenth century. 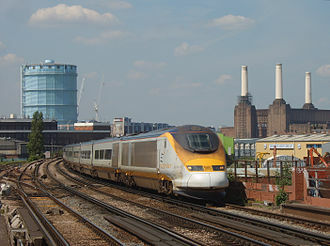 In common with similar inner London areas, it suffered decline when the construction of railways in the 1860s enabled commuting into the city from further afield. The gentrification of the area from the 1950s included new developments to replace war-damaged properties in Canonbury Park North and South as well as restoration of older buildings, east Canonbury is the south-eastern corner of the district, bordering on the Regents Canal. Parts of this area were transferred to the district from the London Borough of Hackney in a boundary adjustment, in the east is the New River Estate, a 1,200 dwelling council estate, completed in 1976 on 26 acres, and designed by Darbourne & Darke. George Orwell moved to 27b Canonbury Square in the autumn of 1944 - he and his wife having been bombed out of their previous flat, in Mortimer Crescent, Evelyn Waugh lived at 17a Canonbury Square from 1928 to 1930. Charles Dickens wrote a Christmas story about a lamplighter in Canonbury, leslie Forbes, the travel and detective story writer, and amateur historian Gavin Menzies both live in the area. Canonbury Tower - The manor house of Canonbury was constructed by William Bolton of St Bartholomew’s Priory between 1509 and 1532, at the dissolution it was granted to Thomas Cromwell. In the 1590s the manor house was rebuilt by Sir John Spencer, Lord Mayor of the City of London, the tower has been occupied by many historical figures, including Francis Bacon and Oliver Goldsmith. The Tower Theatre Company was based here from 1953 to 2003 and it is currently used as a Masonic research centre. Canonbury Square - An attractive square, developed between 1805 and 1830, it includes a variety of distinct styles, in 1812, when few properties had been built, the New North Road turnpike, now known as Canonbury Road, was constructed and bisects the square. The station in 1896, as "Whitechapel and Mile End". The East London Line platforms and tracks were upgraded as part of the East London Line extension. Underground over Overground - an eastbound Underground train departs from Whitechapel in 2012 over the northbound London Overground train. New Cross in 1839. The station is to the left of the road bridge. The rededication of the North London Railway War Memorial in 2011, attended by TfL's Peter Hendy and the Revd James Westcott of St Chad's Church. A London Overground train bound for Dalston Junction arrives at the northbound platform.